Rock by Jan Walker download. To enquire about a painting or if you would like an invitation to the opening of the exhibition, please reply to this page at the bottom or telephone: 01308 459511. To read about the exhibition as a whole please click here. To view Jan Walker’s paintings in the show please scroll down this page. This exhibition draws attention to the ground beneath our feet, celebrating the stuff of landscape and its extraordinary potential in the hands of very skillful artists. Looking with fascination at spectacular and timeless rock faces or relishing transient fortuitous moments in wild coastal places, both Jan Walker and Frances Hatch in their paintings, and Robin Welch in his ceramics, take the material the Earth is made from and communicate through it and about it. 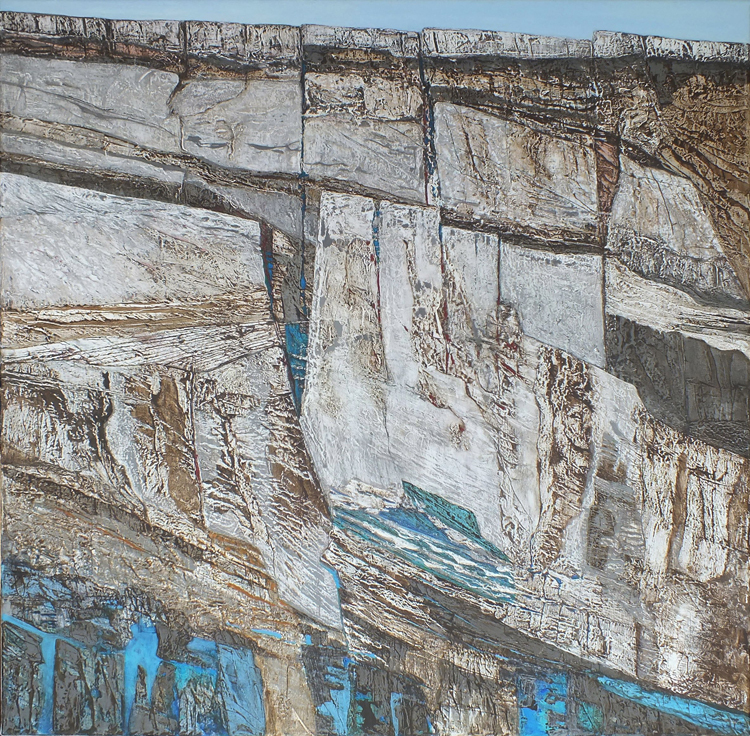 Jan Walker’s powerful paintings have a presence as strong as the rock faces she depicts. Looking back, her life has led her to these works. Brought up living by the sea, the beaches, rocks and cliffs have been a constant presence and source of curiosity and wonder. Her father, a Geography teacher and geomorphologist taught her to appreciate and observe and read the history in rocks. When training as an Art teacher, Jan specialized in ceramics, enjoying its physicality and textural qualities. These three-dimensional elements recur in her paintings as Jan works the paint, enjoying continual experimentation as it’s layered on to canvas or wood panels. Working mostly with palette knives, these layers may be painted over and subsequently attacked by being scraped, worn, heated or even partially removed. 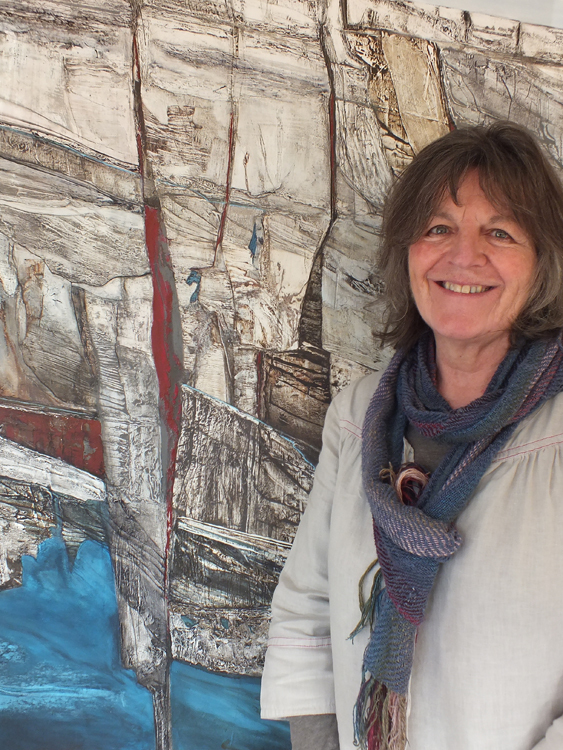 Having stopped teaching eight years ago, Jan now paints full time from her studio in Weymouth, responding to and excited by the Dorset coastline. Like her subject matter, Jan’s paintings develop slowly, forming an exciting journey of discovery for her as parts of the under-painting are revealed and re-worked and the painting gradually emerges and develops. Her working practice echoes the real processes of geology, weathering and erosion which fascinate and motivate her. In addition she has a great visual interest in patterns and cracks and how they are repeated in nature in all different ways and at different scales. The complexity of time and history is evident in the finished surface of the paintings, creating a most striking tension in her work. Jan Walker’s paintings are shown below. They will be available to buy or reserve from Monday 13 April. Please click on an image and see them enlarged with captions. Phone 01308 459511, email gallery@sladersyard.co.uk or reply to this page below to enquire about a painting. Thanks Carolyn – really excited about the show, it’s such a super gallery.